Rumours that Beyonce and Barack Obama are star-crossed lovers have been doing the rounds in the media for the past few days. The gossip coincided with French President Francois Hollande touching down in the States for a state visit with President Obama. A spokesperson for Beyonce has called the rumours "absurd" and insisted that the rumours were just that - rumours. France has been in the midst of the Francois Hollande scandal where he has recently split with his wife and First Lady Valerie Trierweiler as a result of his highly publicised affair with French actress Julie Gayet. 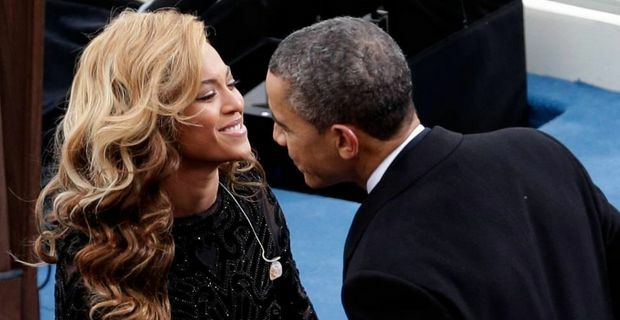 The kerfuffle all began when Pascal Rostain told Europe 1 radio that a big announcement was coming in the States regarding President Obama and Beyonce Knowles-Carter. Rostain catapulted himself into the limelight recently as the photographer who snapped sensitive images of President Hollande visiting the Julie Gayet's home. Once the Europe 1 radio interview aired, French publications Le Figaro and Le Point both ran with stories on the alleged affair. This was enough to send the online community into overdrive as speculation grew as to whether there is any iota of truth to this. It seems that Rostain was trying to generate some publicity for his soon to be released memoirs so he must be pretty chuffed with the reaction he got.